To a lot of people, iOS based mobile/tablet games are considered to be throw away experiences. While they may lack the rich, detailed worlds or immersive narratives common in console titles, they excel in delivering well crafted and addictive gameplay. Because of this, I'm always on the lookout for games that offer me a challenge and feed into my obsession for being a completionist. The latest game to catch my attention is Captain Cat, developed by the newly formed Digital Tentacle. Captain Cat is alarmingly cute and will hook you with its charming and simple design. It stars a cartoon cat that suffers from a feverish hunger for fresh fish. He sets sail on his little boat across the seven seas to satisfy his needs, and plunder for sea treasure. To play, you swipe your finger left or right to position Captain Cat's boat and tap the screen to lower the boat's anchor. Whenever the anchor is stationary it will sway until you press and hold the touch screen to lower it in whatever direction it's facing. Take your finger off the screen and the anchor will stop moving and begin to sway, touch and hold again and you will make a knot in the rope, and the anchor will move off. You can do this as many times as you want to maneuver through the games 70 levels. Gameplay sounds simple, though is challenging. While things start out easy enough you'll soon have various obstacles, environmental hazards and monsters to avoid so you can claim your fishy prize. 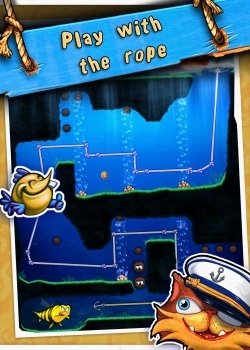 For example, you'll begin to encounter whirlpools after a few stages which when you drop your anchor into will transport it to another section of the level. Later on you will encounter strong water currents which will move your anchor up or down to reach normally inaccessible areas. Visually Captain Cat is a stunning game. It's bright, vibrant and colourful design looks beautiful on the iPad's screen (I reviewed the game using iPad 2, though tested it on the retina display iPad and it looks eye-popping, with a more crisper, deeper look). The style of the game is very cartoonish, which will no doubt be a hit with younger players, but anyone of any age will certainly find it charming. What really stood out to me visually is the little attentions to detail Digital Tentacle have included. For instance, Captain Cat sits on his boat, beaming with a smile as his whiskers flutter in the sea breeze, while the boat puffs with little black clouts of smoke from its chimney. Its minute design choices like these that bring so much heart to this game. 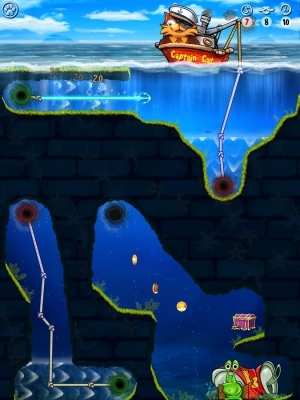 Captain Cat is a stand out iOS game, and is a strong first release by the newly formed Digital Tentacle. Its cute aesthetic, affordable price and quick fix gameplay will be attractive for casual fans and parents looking for a well rounded game for their kids. While it's one touch gameplay mechanics appear simple there is more than enough challenge and depth to draw in the more avid, even core, gamer. As you progress through the game you'll be challenged while attempting to earn 3-stars on each level, achieved by hitting the required target for each, which is broken up into coins collected, knots used and time taken. Another amazing review, summed up the game perfectly and seems like a must buy. For some reason I've had an aversion to iPhone games, but this well written review might change that.